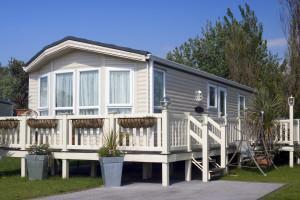 A mobile home can often be a great investment and a wonderful place to live. A Mobile Home Inspection is different from a standard house inspection. It is not unusual for mobile homes to have been trailered in place and propped up on concrete blocks over a concrete pad. There is no basement or second level; but a crawlspace underneath the trailer where the axle, wheels, and trailer frame exists. The electrical, water supply, and drainage systems are then connected underneath giving you the benefits of a standard house. On occasion, the work may be done by the owner or an amateur in these specialized areas which could lead to future problems if not done correctly. The crawlspace under the home is one of the most important areas to inspect. It is also the most difficult to access due to the limited amount of room between the trailer floor and the ground. This can lead to poor workmanship causing plumbing leaks, hazardous electrical conditions, foundation support problems, and poor insulations levels; just to name a few. Our past experience with remodelling and mobile home construction gives us the benefit of knowing what to look for. We have been in those tight spaces and have the tools and equipment to access these ares to give you the information you need to make a well informed decision on your purchase. If you are considering a mobile home purchase we would be happy to assist you in any way possible. Just ask us how. Contact us today and we can book your Mobile Home Inspection.